Library image #3792: Treasure Vault Lake sits among snow-patched mountains. 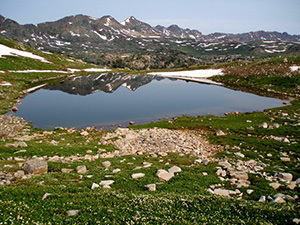 The United States Congress designated the Holy Cross Wilderness (map) in 1980 and it now has a total of 122,446 acres. All of this wilderness is located in Colorado and is managed by the Forest Service. The Holy Cross Wilderness is characterized by rugged ridgelines and glacier-carved valleys complete with spruce-fir forests, cascading streams and dozens of lakes. The wilderness is named after Mount of the Holy Cross, which became famous in 1873 when William Henry Jackson first photographed the cross of snow on the northeast face of the mountain. Over 150 miles of trail traverse the area, providing excellent opportunities for day hiking and backpacking trips. Planning to Visit the Holy Cross Wilderness? How to follow the seven standard Leave No Trace principles differs in different parts of the country (desert vs. Rocky Mountains). Click on any of the principles listed below to learn more about how they apply in the Holy Cross Wilderness.